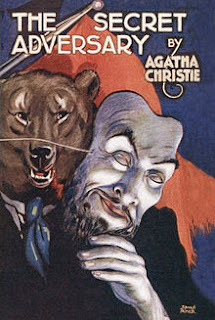 Considering she is THE bestselling author (only surpassed in copies sold by William Shakespeare and the Bible), it shouldn't be surprising that I have only scratched the surface in reading the work of Agatha Christie. And yet, I found myself a little surprised to stumble upon the adventures of Tommy and Tuppence in her second novel, The Secret Adversary. The pair of adventurers were featured in four novels and a bunch of short stories but they are overshadowed by Christie's mainstays Hercule Poirot and Miss Marple. Perhaps it was because they felt so different from Christie's other works, but I found myself really drawn into the story and had a lot of fun with this novel. The Secret Adversary is set (mostly) in London shortly after the conclusion of World War One. It begins with a conversation between two friends, Tommy and Prudence (who goes by Tuppence) as they bemoan their lack of fortunes and try to come up with ways to secure themselves financially. On a whim, they decide to take out an advertisement in the paper and hire themselves out as Young Adventurers "willing to do anything, go anywhere." Before the ad has even run, Tuppence is surprised to find herself approached by a strange man who overheard the pair and wants to hire them but who then inexplicably gets angry and fleas when she gives him a false name, Jane Finn. The next day they take out another advertisement regarding Jane Finn and they are quickly flung into a mystery adventure that threatens to topple the British government. The main conflict in the book revolves around post-war political machinations. Specifically, a group of 'Bolshevists' are working a plot to overthrow the current government and seize power. This multinational plot hinges on the existence of an unknown treaty kept safe by a missing young woman named Jane Finn. Tommy and Tuppence are hired to find Jane Finn and recover the treaty before the enemy can use the treaty to expose and topple the government. Not being a strong history buff, I had a hard time deciding just exactly what this treaty could contain that would do all it claimed possible but I set that aside and just let the MacGuffin serve its purpose in giving our heroes and villains something to search for. The plot maneuvered itself around England, thrusting our young adventurers into one problem after another. The threads of the story grew more and more intricate as new locations and characters made their appearance. Christie did an excellent job dropping clues and foreshadowing to help the reader root for the heroes and try to predict the mysterious mastermind behind the struggle. I found myself changing my guesses a couple of times before the solution finally became clear. Even at the very end, the author threw in a couple of twists and turns late in the story to try and lead the reader down one path or another. Sometimes I find misdirection like this annoying. In this book, I felt like they were very well done and felt like a natural progression of events rather than like the author was trying to hide something from us (even though she was, which is the case with any mystery). I had a lot of fun with the main adventure plot but I felt like the real draw of the story was the characters, particularly the interactions between Tommy and Tuppence. At first, they felt a little stereotypical to me (and some aspects of that remains if looked at from a high level) but I enjoyed the way they were fleshed out throughout the story. Their behaviors and motivations were great and felt really well defined. This lead to a great progression of plot where the course of action felt like the logical and natural course for the characters to follow. I especially loved the dialog. The quick witted banter of Tuppence was delightful and the back-and-forth, particularly between she and Tommy, was great fun. On the whole, I really enjoyed this book. The characters felt fresh and fun. The writing was solid and flowed well. The pacing was good at keeping the action going while still slowing down enough for logical exposition and moments of insight to let the reader delve into the mystery themselves. The plot was laid out logically with just enough information withheld to keep the solution at bay while also revealing enough to let the reader feel wise and informed. Reading this makes me want to seek out more adventures of Tommy and Tuppence. Fortunately, there are more to be found. I'm a Husband. A Father. A Son. A Brother. A Friend. Happily married to an amazing woman and my best friend since 1996 with 3 wonderfully fabulous kids. I've worked for the past dozen+ years in the software industry doing QA work on projects ranging from data manipulation to video games to web sites and applications. I have a degree in English and plan (one day) to teach High School English. I love to Read, Write, play Board Games & Video Games and just have fun with family. I love to travel when I can and especially love the beach and the ocean. I'm also a huge Disney fan and love the Disney Parks.